When the handset needs to be clamped,please move the mobile phone to the 50-80mm above the mount.The mount automatically opens the clip,and easily puts the mobile phone into the mount.The clip automatically retracts the handset.If you need to take your handset,touch the on-off keying on left side of the mount,the clip is opened automatically and handset can be taken out. 1.When using the suction , please fasten the locking buckle. This will keep the holder tight enough when driving. 2.When the mount is in standby mode,LED is a green breathing effect,and when the phone is charged or full of electricity,it is green.The red light flashes and is not allowed to charge when errors such as excessive temperature,flow,and foreign bodies are wrong.When trouble occurs,insert the charging line into the USB. Use the 5V/2.5A-3.5A standard charger. 【One-hand Operation】 Fully automated wireless car charger with build-in advanced infrared sensor. The two clips will automatically open and grip your phone when you put the phone close to the holder. Easy to use and safe driving. 【2 in 1 function】Combines wireless charger and phone holder in one unit. Wireless charging pad offer a quickly charging while driving. Save you from the tangled locating cords or cables, the process plug cable in and out of device. 【Two installation options】Air vent mount and suction mount installation, employs a telescopic arm to allow for closer device viewing You could adjust the holder enable to hold the phone in a perfect viewing angle while driving. 【Wireless Charger Application Models】The wireless charging compatible with Samsung Galaxy S8/S8 plus, S7/S7 Edge, Note 8, iPhone X, 8/8 Plus and other Qi-enabled Devices support 5V standard wireless charging. 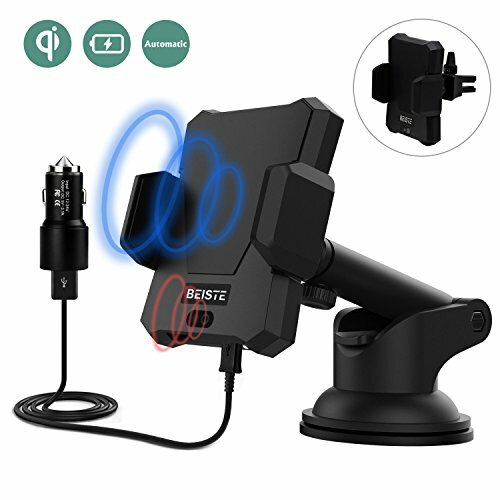 【12 month Warranty】For this smart car holder, BEISTE guarantees a hassle free 1 year warranty, contact customer support for assistance. If you have any questions about this product by BEISTE, contact us by completing and submitting the form below. If you are looking for a specif part number, please include it with your message.